If your home is not designed to accommodate a cat litter box (no laundry room, no basement, no terrace, or any other special room where you can hide it), and if you don't like the looks of a an exposed litter box in your bathroom, kitchen or other areas of your home, you might want to consider getting a cat litter box cabinet. They hide the litter box and contain mess and odors. They provide extra storage space for litter, litter scoop, etc. They provide privacy for your cat. They can be cleaned easily thanks to built-in lateral or top doors. They come in many attractive styles and colors that blend in with the rest of your furniture and therefore can be placed in any room. Some provide extra space for your cat to sleep on. This review will compare two best selling litter box cabinets bought by Amazon customers at the time the review was written. They are the Merry Pet and Designer Catbox cabinets. These are not just popular, but they also represent high quality workmanship that combines smart and stylish design with efficient practicality. The rest of this review will describe and compare the two selected cabinets to help you decide which one would suit best your needs. Otherwise, continue reading below starting with the cabinet descriptions followed by a product comparison table. Though the main use of this cabinet is to hide the litter box while keeping litter mess inside and containing litter odor, it can also be used beside your bed or your living room couch, as a handy night stand or coffee table that provides your the cat with a private space. It comes with a built-in shelf that can be used for storage and is equipped with a stainless steel towel bar for various organizing options in the laundry room or bathroom. The front opening allows cat's entry and exit. It features a wooden cabinet, wainscoting paneling details and stainless steel hardware. The door is magnetized and opens wide, so you can easily clean. It is very easy to assemble and comes in 3 attractive color options (white, espresso and walnut) to match any room and blend with all types of furniture . An espresso color Merry Pet litter box cabinet is shown in the top left picture, and a white one on the here. Made of high quality wood with an elegant stained wood-grain finish and stylish wainscoting, the Designer Catbox contains two compartments. The first is where the cat discretely enters from the side of the cabinet and where various accessories such as the litter scoop may be stored. The second compartment is separated from the first by an internal panel and it's where the litter box is placed. The internal panel has a large opening to allow the passage of the cat from one compartment to the other. The first compartment is equipped with a hook to hold the litter scoop. The interior panel and a staggered entrance prevent litter from being kicked onto the floor. The outer hole can be set up on right or left. The lid opens up, and a hydraulic safety hinge holds it up for easy cleaning. The Designer Catbox cabinet is easily assembled, and comes with detailed instructions. It is offered in three attractive color options (white, espresso and black) . 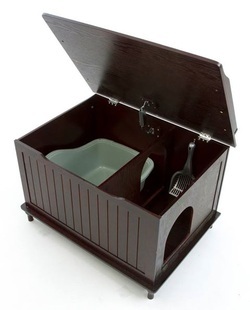 An espresso color Designer Catbox litter box cabinet is shown in the picture. 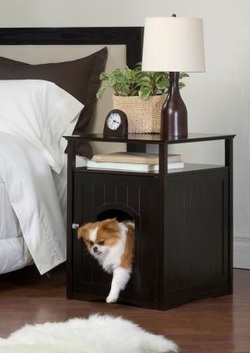 Merry Pet offers an extra shelf for storage and a stainless steel towel bar. Designer Catbox provides some storage space within the entry compartment of the cabinet. A hook is provided there so that the scoop may be hung. Merry Pet comes in espresso, white and walnut. Designer Catbox comes in black, white and espresso. So which Litter Box Cabinet to get? 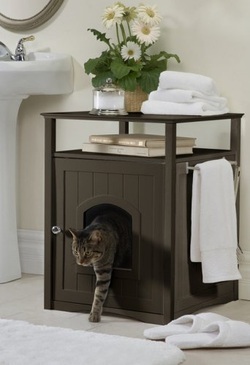 If you are looking for discretion and don't want your guests to know that the cabinet contains a litter box, you might want to consider getting Designer Catbox, because it has the cat entry hole on its side. The entrance to the box is better hidden than on a Merry Pet cabinet which has the entrance in front and is visible. Note also that with a Designer Catbox cabinet, one may choose to place the cat's entry hole on either side of the box. Therefore, regarding discretion, Designer Catbox wins. 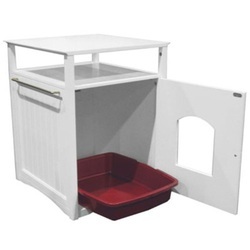 If you are looking for a litter box cabinet that will provide you with extra storage, then Merry Pet which comes with a storage shelf will do fine. Designer Catbox provides some storage space inside the cabinet, but the space is more limited. Therefore, in terms of storage space, Merry Pet wins. If you are looking for attractive style that will blend best with your living room or bed room furniture, you might want to consider either litter box cabinet as they are both made of high quality wood and come in various attractive colors you can choose from so that it matches your furniture. Please click the litter cabinets below for price information or to purchase. ​Have you not found yet the product your are looking for?